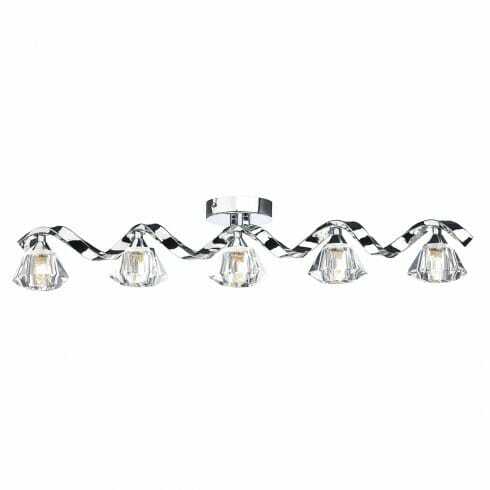 Dar Lighting Ancona 5 light ceiling fitting features a circular ceiling rose and a twisted ribbon style polished chrome bar which supports 5 evenly spaced clear crystal glass shades. The product code for this Dar ceiling fitting is ANC0550. Each ribbon style arm supports a clear crystal glass shade which provide sparkling illumination, making this perfect for both mdoern or contemporary decors within your home. This pretty ceiling light is part of the larger Ancona range where matching a wall light and ceilings lights of a differing design are available on the same theme.